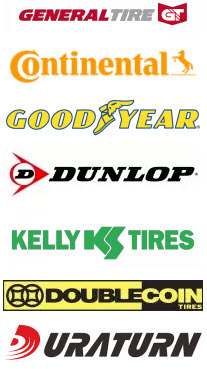 Hogan Tire is your source for tires from all the leading commercial brands, including General, Continental, Goodyear, Dunlop, Kelly, Double Coin and Duraturn. Our team stays up-to-date with the newest commercial tire releases, ensuring that we have access to the best and latest in commercial tire technology. Extend the life of your commercial tire investment with our retreading services. You’ll benefit from exceptional ROI by extending tire lifespan at far lower costs than buying new tires. New technologies have made retread commercial tires safe, delivering great performance and an excellent value. Retread tires are also an environmentally responsible choice. The highly experienced and fully trained experts at Hogan Tire will inspect your commercial tires and advise you of the safest and most cost-effective repair options. If repair is an option, we’ll perform the work and get back on the road fast. Regular tire and wheel balancing service helps truck tires wear evenly and minimizes vibrations by optimizing the weight placement around the tire and rim assembly. Our commercial tires and tire services will keep your fleet rolling and profitable, while ensuring safety and fuel efficiency. Trust the Hogan Tire team of professionals with your fleet tire needs.